Blue Aventurine combines the elements of Wind and Water in a gentle stone that resonates from the mind to the heart, working calmly, rationally, and steadily. It enhances the masculine energy in both males and females, and is a stone of self-discipline and inner strength, assisting one in making clear decisions and sticking by them. It promotes taking full responsibility for one’s life, relationships and experiences, while lending the support needed to empower change when the current reality isn’t working. 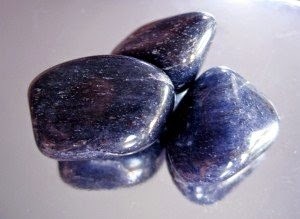 Blue Aventurine is particularly stimulating to the Third Eye and Throat Chakras, opening one to higher spiritual guidance, and revealing psychic and intuitive abilities that may previously have been blocked. It encourages open and honest communication and speaking one’s mind and heart. This crystal not only embodies strength, but honours peace and caring for others. It is a stone sacred to the Glory Angel, Raphael - the ruler of Mercury and the Angel of Compassion, Knowledge, Progress, Repentance and Love. In the workplace, Blue Aventurine is a crystal of leadership and helps to earn respect. It assists in approaching new projects calmly and without nervousness. Wear Blue Aventurine as jewelry, drink as an elixir, or hold as a worry stone for a calm, focused performance in sports competitions, musical events, or any public speaking engagement. It is an ideal ally for teachers, encouraging vision and inspiration, and aiding in expression and effective communication. Blue Aventurine encourages adventure at any age and is a stone of travel, helping to make desired travel plans happen and for protection against travel interruption. Place in luggage or personal items to prevent loss, and to encourage safety on holidays or weekends away. 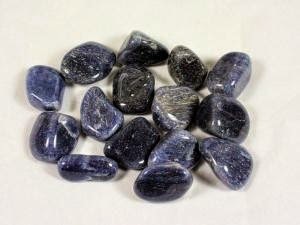 Blue Aventurine ameliorates pain and chronic stiffness, and may help in lessening muscle twitches, spasms and facial tics. It assists in calming hyperactivity, and enhances mental focus and concentration. This crystal is beneficial in overcoming insomnia, lessens migraines and headaches, and aids the eyesight. It has a cooling effect and reduces fever; it is believed to relieve sinus problems, allergies, colds, coughs and congestion. Blue Aventurine resonates with the upper chakras, from the mind to the heart, and is especially stimulating to the Third Eye and Throat Chakras. The Throat Chakra is the voice of the body, in essence, a pressure valve that allows the energy from the other chakras to be expressed. If it is blocked, or out of balance, it can affect the health of the other chakras. When the Throat Chakra is in balance and open, it allows for the expression of what we think and what we feel. We can communicate our ideas, beliefs, and emotions, bringing our personal truth out into the world. We have an easy flow of energy within the body and spirit. Blue crystal energy will unblock and balance the Throat Chakra. Darker shades of blue encourage the power of truth, while lighter shades carry the power of flexibility, relaxation, and balance. Blue Aventurine assists in opening one to their innate powers and sensitivities that may have been blocked by inner disharmony. By clearing the Throat and Third Eye Chakras, it allows one to perceive the spiritual gifts they may have been given and attune to guidance from the higher realms. One may find an increase in psychic and intuitive abilities, a capacity to empathetically “read” others, or a potential for receiving information from the Akashic record. Whether it is used in meditation, dream work, or simply kept in close proximity, Blue Aventurine provides the inner strength to explore these possibilities and the patience to see it through. 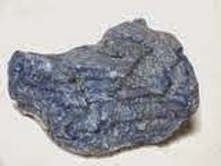 Though Blue Aventurine works gradually, it also works steadily and has a great capacity for psychic opening. It is quite useful in meditation as a transitional aid, and brings additional strength and focus to the energies of other stones. Place it upon the Third Eye in meditations, or sleep with one in the pillowcase for dream work.